Looking for an out of the ordinary location for your next group adventure? We have the place for you! Climb to new heights and experience adventure in a unique setting. At TreeRunner West Bloomfield imagine yourself exploring 195 aerial challenges, speeding along 41 exhilarating zip lines, and challenging yourself on 12 trails with 6 varying degrees of difficulty! If you are new to the aerial obstacle experience, no worries, TreeRunner is designed for beginners and experts alike. Our outdoor adventure is perfect for both small and large groups. We can host events from 10 people to 150 people! Groups return to TreeRunner West Bloomfield year-after-year because it is always a fun and memorable experience. Come out and join us and you will see why! Advance reservations are required! For more information, please contact our Group Sales Director at Tracey@TreeRunnerParks.com. Looking for a new and unique idea for your next birthday? Come out to TreeRunner West Bloomfield and celebrate your special day while doing something fun and active. Below is your guide to the ultimate birthday party in West Bloomfield. Click here to find out more about Birthday Parties at Treerunner! TreeRunner West Bloomfield invites your school group out for some fun in the trees at a special price! Our park stretches over eight acres and ranges from beginner to advanced climbing levels, while presenting a rewarding challenge for most ability levels. We are a perfect destination for School Field Trips and Summer Day Camp outings! Click here to find out more about school and summer camp visits at TreeRunner! TreeRunner West Bloomfield invites your youth group, scouts, and athletic teams out for an exhilarating and fun experience! Stretching over eight acres and ranging from introductory to advanced climbing levels, TreeRunner presents a rewarding challenge for most ability levels. Take your youth group, scouts, and athletic teams on an adventure to remember! Get your staff out of the office and climb to new heights, by taking them to a place where they can bond with their fellow coworkers and challenge themselves in the great outdoors! TreeRunner offers Discounted Group pricing – great for small and large groups! Some of Michigan’s largest and most well-known companies plan their yearly outings at our venue. In addition to a fun day in the treetops, we offer a beautiful covered picnic area for your enjoyment. Inquired about preferred pricing from local caterers. Click here to find out more about Corporate Outings at TreeRunner! 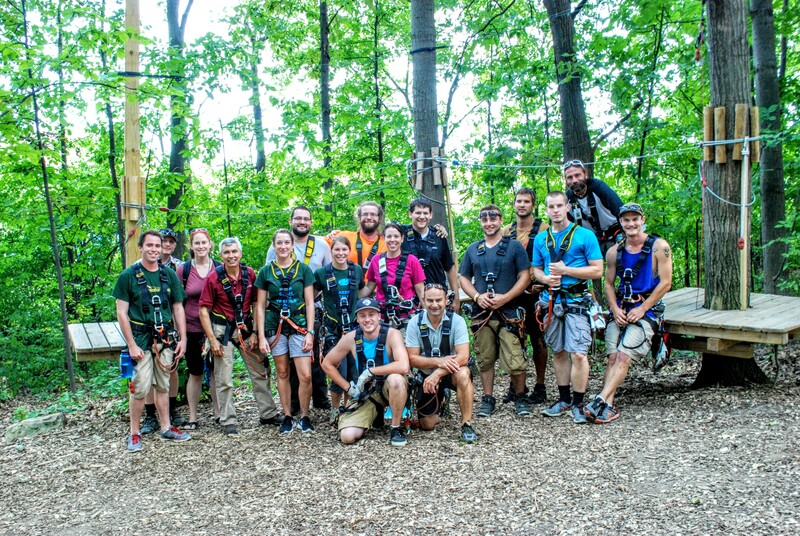 Team Building in the trees is fun, effective, and a totally unique experience! Our Team Building packages enable us to take a group out of their day-to-day routines, break down barriers, and work with new team members in a fun and adventurous setting, all while being 10-35 feet in the air. Click here to find out more about Team Building at TreeRunner! Call for more information or fill out the form below! Fill out the form now for more information!